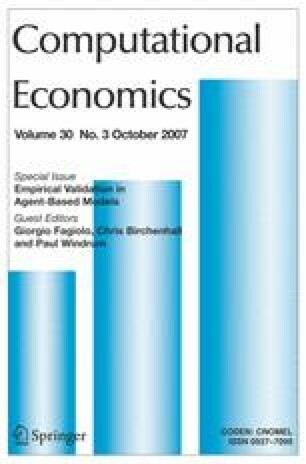 This paper addresses the methodological problems of empirical validation in agent-based (AB) models in economics and how these are currently being tackled. We first identify a set of issues that are common to all modelers engaged in empirical validation. We then propose a novel taxonomy, which captures the relevant dimensions along which AB economics models differ. We argue that these dimensions affect the way in which empirical validation is carried out by AB modelers and we critically discuss the main alternative approaches to empirical validation being developed in AB economics. We conclude by focusing on a set of (as yet) unresolved issues for empirical validation that require future research. Brenner, T., & Werker, C. (2008). A taxonomy of inference in simulation models. Computational Economics, http://dx.doi.org/10.1007/s10614-007-9102-6. Marks, B. (2007). Validating simulation models: A general framework and four applied examples. Computational Economics, http://dx.doi.org/10.1007/s10614-007-9101-7.